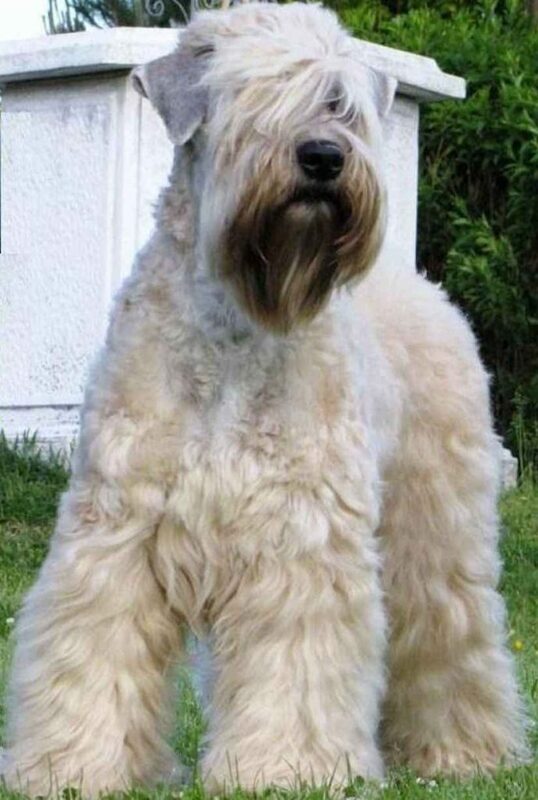 Soft Coated Wheaten Terrier is known in Ireland for more than two centuries. The Soft coated Wheaten Terrier was the poor man’s hunting dog, a slayer of vermin, a herding dog, and a watchdog. It was an all-purpose working farm dog used for destroying vermin, hunting small animals, herding, and guarding against intruders. 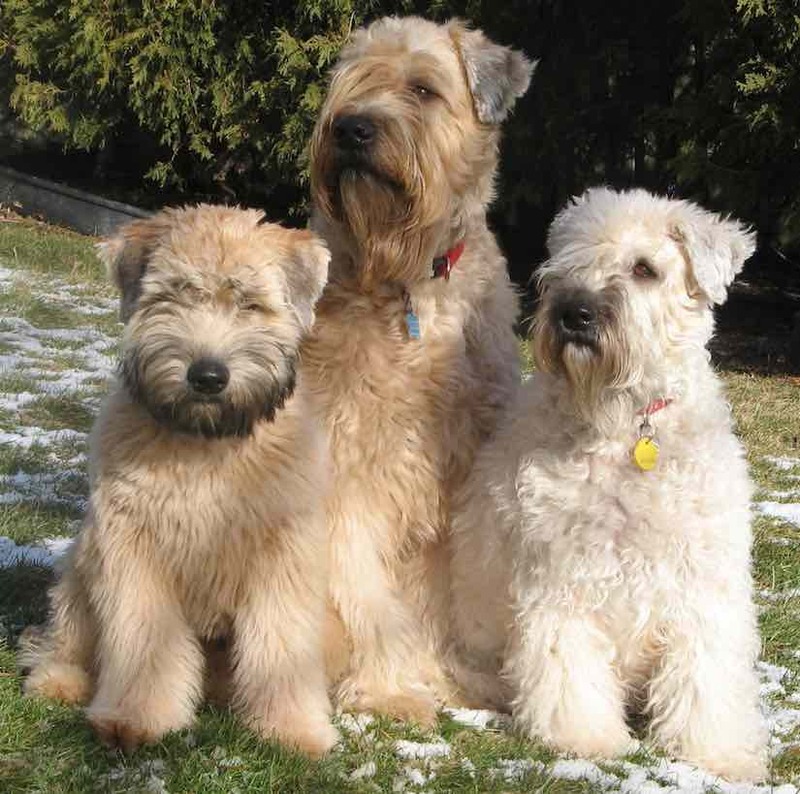 Soft Coated Wheaten Terriers are thought to be one of the ancestors of the Kerry Blue Terrier. The tousled-looking farmer’s dog attracted little attention until a terrier match in 1932 when a group of fanciers decided to form a club. 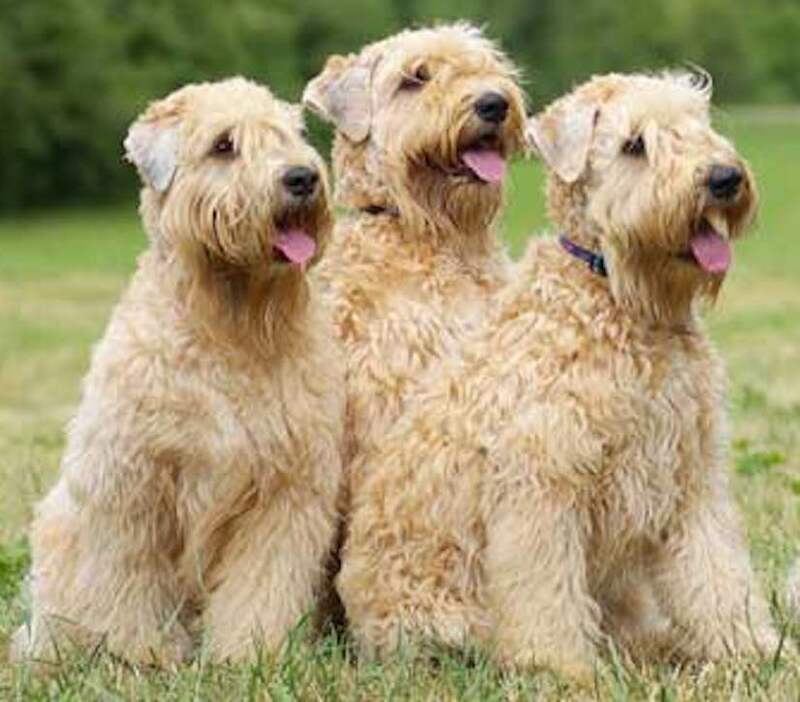 The breed was first dubbed the Irish Wheaten Terrier, but that was considered too close to the Irish Terrier, so it was changed to the present name. The breed was first exhibited in 1937 and placed on the list of native Irish breeds. In the beginning, the breed was shown in its natural shaggy state but when other terrier fanciers derided them as looking like so many haystacks, the owners began to ‘top and tidy’ them, eventually resulting in the familiar scissored trim now seen in the North American show ring. The Wheaten is a happy, steady dog with an aura of self-confidence, inquisitive and alert. Good-tempered, spirited, and game. Affectionate and loyal. Alert and intelligent. Defensive without aggression. He does not start a fight, but should always stand his ground; exhibits less aggressiveness than is sometimes encouraged in other terriers. General Appearance: The Soft Coated Wheaten Terrier is a medium-sized, hardy, well- balanced sporting terrier, covered with a soft, silky, wavy coat of clear, warm, wheaten color. The breed requires moderation in all points and any exaggerated features are to be avoided. The Soft-Coated Wheaten Terrier should present a square outline with the overall appearance of a steady, happy, well-coordinated animal who is alert to his environment and carries himself with a gentle dignity and self-confidence. Males 18 – 19 inches (46 cm – 48 cm) with the ideal height being 18 1/2 inches (47 cm); for females 17 – 18 inches (43 cm – 46 cm) with the ideal being 17 1/2 inches (44 cm). Ideal weight for males is 35-40 lbs. (16-18 kg); for females 30-35 lbs. (14-16 kg). Deviations from the ideal should be penalized according to the amount of deviation from the ideal. Coat and Colour: Abundant, single-coated, soft, silky-textured, having a gentle wave that is apparent when standing. When the dog moves the coat has a free and flowing character to it. Neither wooly nor wiry, crispy nor cottony, frizzy (tight, crisp curl) nor straight. Colour is any shade of wheaten. Upon close examination, occasional red, white or black guard hairs may be found. 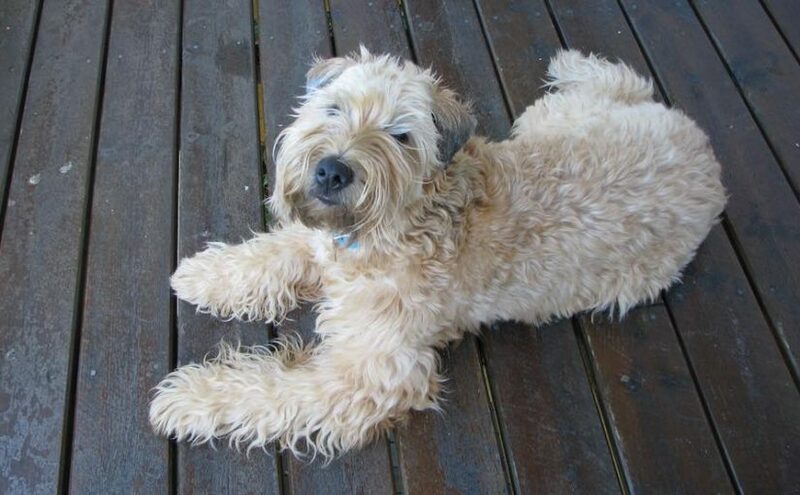 However, the overall coloring must clearly be wheaten with no evidence of any other color except on ears and muzzle where blue-gray shading may be present. Soft Coated Wheaten Terrier Puppies under one year may carry deeper coloring and some black tipping. The adolescent under two years may be quite light in color, but must never be white nor carry gray, other than on ears and muzzle. In both puppies and adolescents, the mature, wavy coat is generally not yet seen. Coat color and texture do not stabilize until about three years of age and some latitude should be given in young dogs. However, the softer and darker puppy coat should not be preferred over the lighter and slightly harsher adult coat. For show purposes, the coat should be trimmed to present a neat, square terrier outline. Overstyling is to be discouraged and severely penalized. Head: Well balanced and moderately long with skull and foreface of equal length and in good proportion to the body. The skull is flat and not too wide. Cheeks are clean; moderate stop. The muzzle is square, powerful, and strong with no suggestion of snippiness. The nose is black and large for the size of the dog. Lips are tight and black. Teeth are strong and white, meeting in a scissor or level bite with scissors preferred. The eyes are dark hazel or brown, medium sized and well protected under a strong brow. Eye rims are black. The coat should fall forward over the eyes. The ears are small to medium in size, breaking level with the skull, and dropping slightly forward, close to the cheeks, pointing to the ground rather than the eye. Neck: Medium in length and set well upon the shoulders, gently sloping into the back. 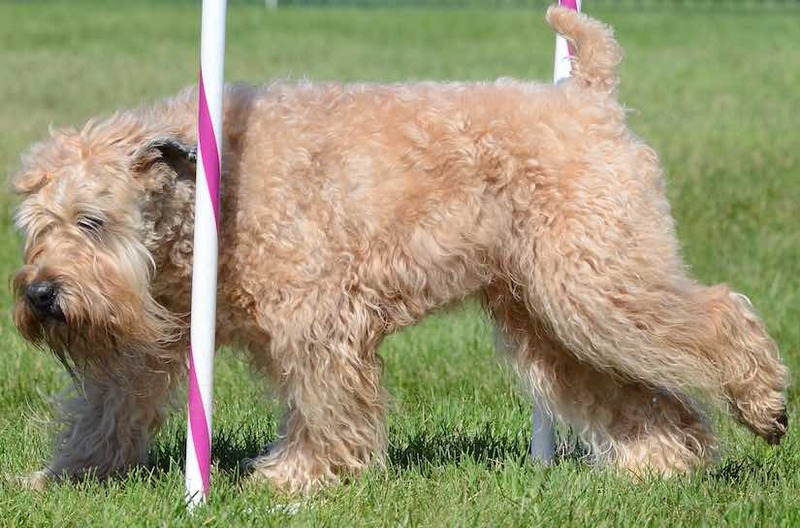 Forequarters: The Soft Coated Wheaten Terrier should have good reach in front. The shoulders should be well laid back with a clean, smooth appearance. The upper arm should be equal in length to the shoulder blade and elbows placed well under the body. The forelegs are straight when viewed from all angles and are well boned and muscled. Dewclaws should be removed. Feet are round and compact with good depth of pad. Dark nails are preferred but tortoiseshell is acceptable. Pads are black. Body: The body is compact; the chest is deep, but not round. The ribs are well sprung. The back is strong with relatively short coupling. Topline is level. Hindquarters: The Soft Coated Wheaten Terrier requires a good drive from behind, so requires well-muscled rear assembly. The legs should be well developed with powerful muscles, well-bent stifles, turning neither in nor out. The hocks are well let down and parallel when viewed from behind. Dew claws on rear legs must be removed. Dark nails are preferred but tortoise shell is acceptable. Tail: The tail is high set, carried gaily but not over the back. The tail is usually docked so that two-thirds of its original length remains. An undocked tail is allowed. Gait: The gait is free, graceful and lively, having good reach in front and strong drive from behind. 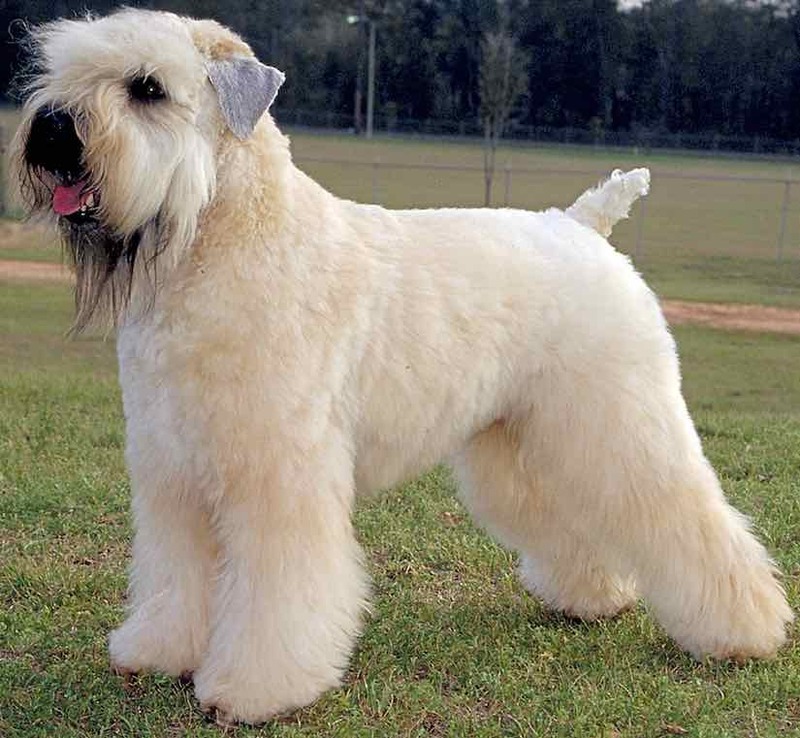 Faults: The above description is that of the ideal Soft Coated Wheaten Terrier. Any deviation from the above-described dog must be penalized to the extent of the deviation, keeping in mind the original purpose of theSoft Coated Wheaten Terrier breed. Major Faults: Yellow eyes; Nose not solid black. Disqualifications: Overshot or undershot mouth; over-aggression.